32 Pages. Color. A4. Spiral Bound. A Beginner Guide. For the Advanced Mind. New 9th Edition! Revised & Updated. Welcome to the world of the Skyflowers! 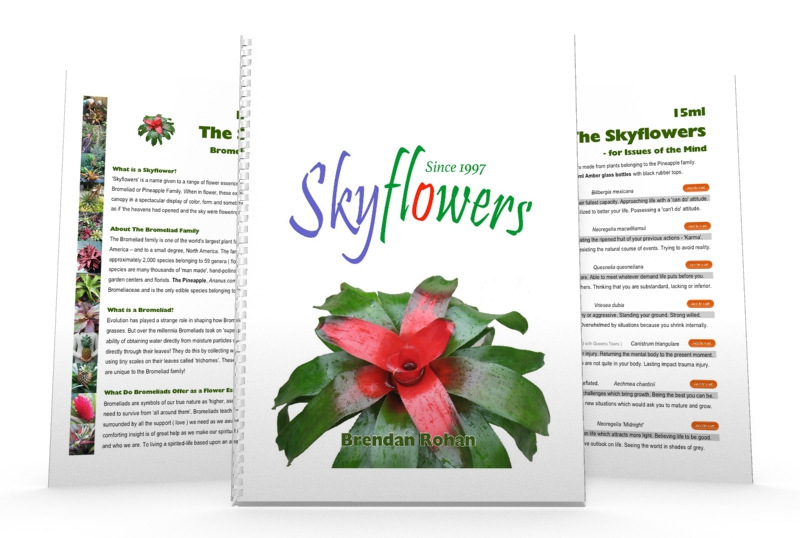 This easy-to-read, 40 page reference guide marks the 22nd anniversary of a fascinating study of the Bromeliad family – the Skyflowers. Designed to be simple-yet-informative, this handy reference guide will cater to both beginners and flower essence therapists alike. Alphabetical, 3-line listings makes looking up a particular remedy easy and short, key-word definitions provides just the right amount of information to understand what each remedy is used for. 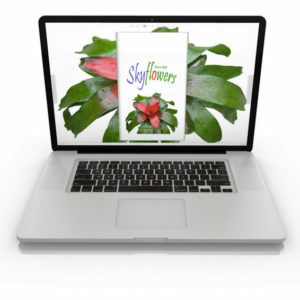 The book is a great introduction to the world of the Skyflowers and makes a good starting point for further study of the remedies made from these amazing, ‘air-dwelling’ plants! Simple, 3-line listings for 150+ individual remedies, pre-mixed combinations and special formulas. 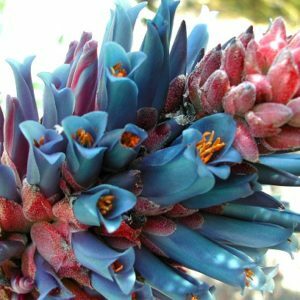 An Introduction to Bromeliads, their general properties and what they have to offer as a flower essence remedy. Step-by-step instructions on how to use the remedies and tips for choosing the right essence for you. Takes the guess work out of flower essence therapy and turns flower essence therapy into a clinical practice. Educates and raises awareness before a remedy is even applied. The Skyflowers: 9th Edition is the biggest update yet. The manual has more than 60 hours of revisions and literally everything in it has been overhauled. Here is the list of major changes. A complete rewrite and expansion of the introduction. Provides a clearer overview of the properties of the Pineapple family & their spiritual lessons. New product guides and infographics have been added to clarify topics. Including what’s inside the Skyflowers: Starter Set. Massive text refinements to the Skyflowers: Pro System. 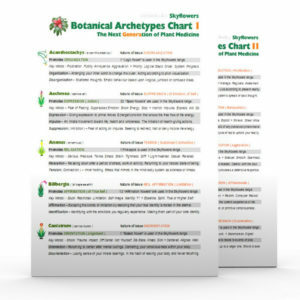 How to use the system of botanical diagnosis is now simpler to understand. 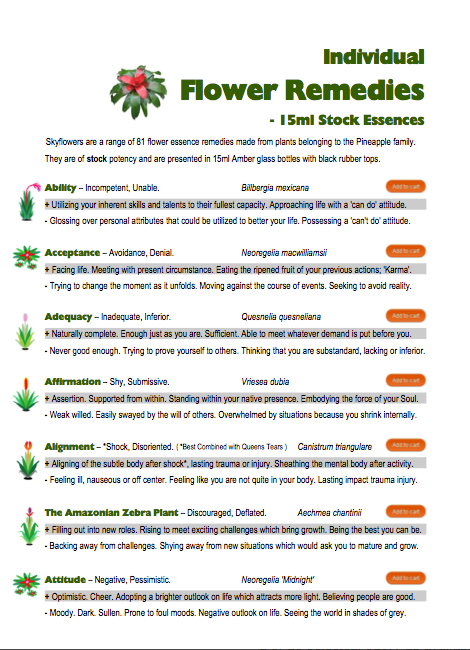 9 new 15ml flower remedies. Approx. 50 of the definitions for the 15ml remedies were revised and rewritten. They now are a lot clearer and ‘hit the nail on the head’. A complete refresh of the 25ml combination formulas. Some have been deleted, new ones have been added, recipes have been update and some names have been changed. New guide to combining flower remedies. New guide to the box sets, complete with a list of flowers in each. To see the full list of changes, see this post. The 8th edition of the Skyflowers has a focus on the professional box sets and celebrates the release of Skyflowers: Infinite Mind. The manual contains 11 new 15ml remedies and new recipes for twelve 25ml combination formulas. A new page to help you choose the right box set for your clinical work. This page will be updated and refined in future editions. With the 8th edition comes the update of the Desktop Companion Apps – for Mac and Windows. Both contain a complete copy of the print version of the guide. Bronze Flaming Sword – Subordinate, Powerless. Pink Spear Bromeliad – Controlled, Enslaved. 2 new 25ml Formulas – for Everyday Issues. Numerous recipe changes. Updated with new release flowers. Minor text changes, refinements and updates. The 7th edition of the Skyflowers Guide is even bigger than the last update. It contains 7 new 15ml remedies and 9 new 25ml combination formulas. Also, every single line of text was revised to reflect the latest research and the revisions took more than 40 hours to complete. This is all on top of the fact that the 1st edition took more than 7 years to complete! The first thing to note is that the name has changed from the Skyflowers Reference Guide to the simpler Skyflowers Guide. With the 7th edition comes the update of the Desktop Companion Apps – for Mac and Windows. Both contain a complete copy of the print version of the guide. 9 new 25ml Formulas – for Everyday Issues. Major text changes, refinements and updates. Major change of Chilean Blood Grass and Chilean Blood Grass II descriptions to further distinguish between them. Same properties, different descriptions. Major change of Pink Sacred Heart and Red Sacred Heart descriptions to further distinguish between them. Same properties, different descriptions. 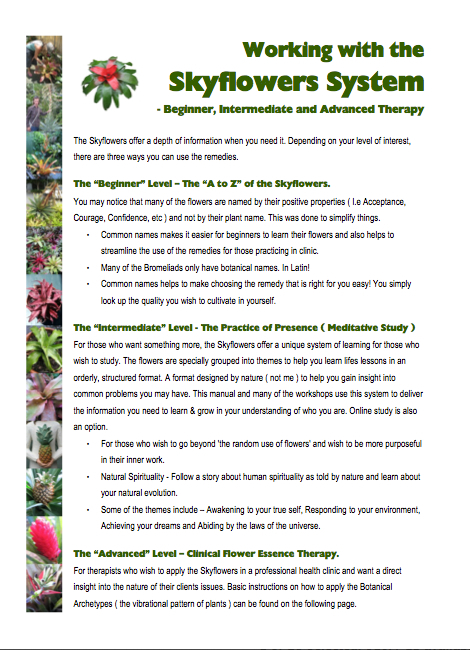 The 6th edition of the Skyflowers Reference Guide is the biggest update yet, with the changes focused mainly on the Skyflowers: Higher Ground remedies with numerous text refinements and ‘tweaks’ to those remedies that reflect the current research. The update celebrates the completion of the research on the Skyflowers: Higher Ground remedies and is part of the preparations for the forthcoming box set of the same name that is scheduled for August 2015. Although these 25 remedies are presented on just 3 pages of the guide, I would like to point out that those 3 pages took me 8 years to research, write & refine! The first thing to note is that the name has changed from the Skyflowers: A-Z Guide to the Skyflowers Reference Guide. Yes, the guide now has a more posh name! With the 6th edition comes the release of two new Desktop Companion Apps – for Mac and Windows – that contain a complete copy of the print version of the guide. These apps are free to download. 6 New Skyflowers: Higher Ground Remedies for Issues of the Soul. Carnivorous Bromeliad – Manipulate, Exploit. Star of Venezuela – Divided Psyche, Schism. 4 new 25ml Combination Formulas. Higher Heart – for facing the truth of your current experience. I.e. ‘Honesty drops’. Higher Self – for spiritual low self esteem caused by living in your own shadow. Survival – for entering and exiting survival mode. Name change. Clarity > Enlightenment 25ml – for Mental Clarity. Name change. Resilience > Strength 15ml. Name change. Validation > Belief 15ml. New botanical logo for Genus Puya. Added 4 new Skyflowers: Higher Ground Essences! Added 2 new Skyflowers: 25ml Formulas! Name Changes. Same flowers, better names. Old Sanctuary 25ml Formula -> New Protection 25ml Formula. Revised entry for Chilean Blood Grass. Revised entry for The Green Carpet Bromeliad. 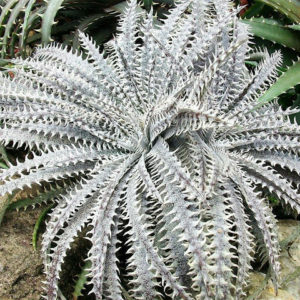 Changed Logo for flowers belonging to Genus Puya. Added 2 new Skyflowers: Higher Ground Essences! 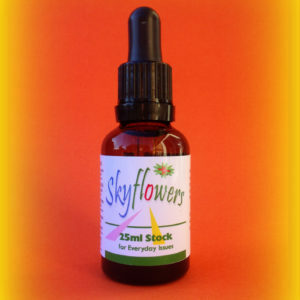 Added 1 new Skyflowers: 25ml Formulas! Old Cohesion -> New Communion. Old Involvement -> New The Dangling Air Plant. Old Silver Grass -> New Silver Grass Bromeliad. Old Transition -> New Transmigration. Old Vulnerability -> New Passion. Revised essence descriptions. General refinement, revision and ‘tightening up’ of the essence descriptions. Nothing radical, just clearer. Added links to website product pages to make it easy to find the remedies on the web. 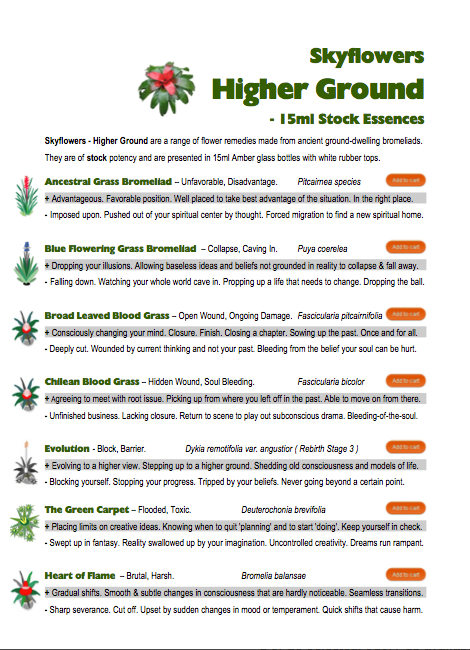 Added 10 new Skyflowers: Higher Ground Essences! 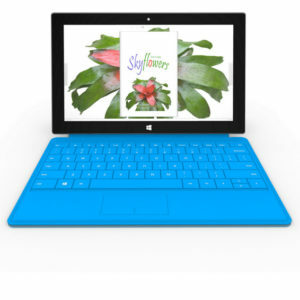 Added 3 new Skyflowers: Practitioner Formulas!